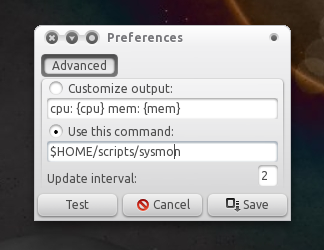 Indicator-Sysmonitor (System Monitor Indicator) is a really interesting Ubuntu indicator because it allows you to display pretty much anything on the Unity (or GNOME) panel by using a simple command or a bash script. Currently there is no AppIndicator to display the actual network usage as in the actual values on the Unity panel in Ubuntu. We have Indicator Multiload but it only displays a graph so I wrote a script for Indicator-Sysmonitor to display the network upload/download speed as well as CPU and Memory usage (Indicator Sysmonitor already has CPU and Memory usage but if you want to use a script, you must get your script to display the CPU and Memory usage independently). 4. Setting Up System Monitor Indicator to use the script. What these do is pretty much obvious - change the items you want to be displayed on the panel to true and the rest to false. Feel free to tweak the script to display other stuff if you want.